01.) We started Saturday at the crack of 10:00 at IHOP. 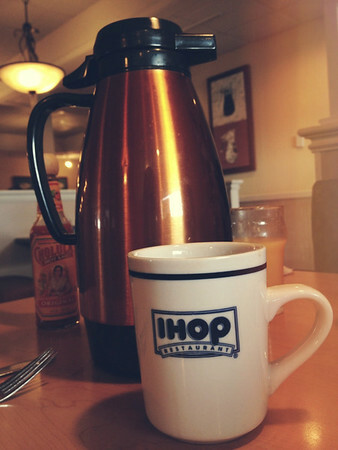 My own carafe of coffee is why IHOP will always be tops in my breakfast book. And the pancakes aren't too shabby either. 02.) Annelise is torturing me working on her first science fair project. The good thing is they work on everything in stages and are responsible for completing (and having the teacher review) each stage before moving on to the next so there's no way she (we) can put the entire thing off until the night before. Not that that would ever happen or anything. The other good thing is I may or may not have steered Annelise to a fairly easy, low-key (at least that's our hope) consumer science-y project, to which she was agreeable and interested in (ish) about which bubble gum lasts the longest. 03.) Scott and I went on an impromptu date (ish) last night once Annelise decided she wanted to have an impromptu sleepover with Pappo and Grandma Peggy. We had this long roundabout discussion about where to go and why or why not and how we wanted to go somewhere that Annelise wouldn't feel gypped and not somewhere we always go as a family (we're fairly boring), and of course this discussion followed a drawn out diatribe on our poor eating habits of late along with scant exercise blah, blah, blah. At first we though about Ghengis Grill but talked ourselves out of that because we normally go there for lunch and didn't want to pay for dinner bowls and it was later at night and we (okay, me) worried that the buffet choices might not be restocked or as fresh, so we decided on Pei Wei even though I am always slightly disappointed with my selections there (I don't have a go-to fave there). On a whim we went to Bonefish Grill instead. Scott had been there for lunch before but I hadn't so we thought, why not try something new (ish). While it was very, very good, it turned out to be um...fancier and pricier at night than we expected. We were definitely underdressed for the hipster crowd that congregates there. Oh well. We laughed though at how we hadn't wanted to pay for dinner bowls at Ghengis Grill (like what, $10-$12 each?) and ended up almost tripling that. Oh well. 04.) 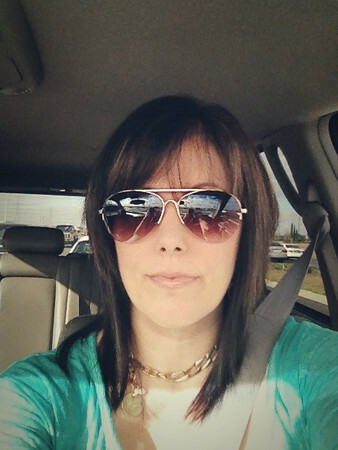 So, on a semi-whim I became a brunette earlier this week. 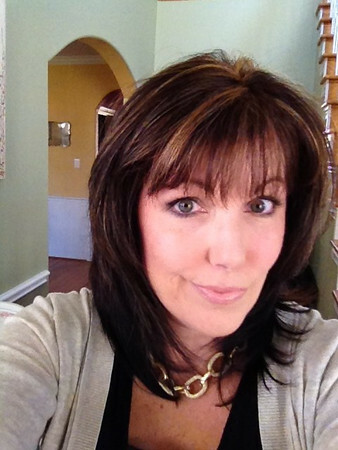 While I loved my bold, blond highlights, I was ready for a change, something more all one color with more subtle highlights. Now I think going sooooo brown has triggered an identity crisis of sorts. I'm still in shock every time I pass a mirror. Who is that woman? Wait. Is she wearing a wig? Is that me? That IS me. And what's up with the bangs? I feel like it's such a drastic change and possibly too harsh. I mean, it's almost black, y'all. I feel like one of the Real Housewives of New Jersey or something. I've been playing with my make-up a bit (smokier eye, a bit more blush) because otherwise I feel too washed out, but wearing more make-up feels weird too, like, whoa. So I've been in a bit of an insecure heap. But then sometimes I like the new me. 05.) I was going to do a Five for Friday post, but then didn't. Obvs. 06.) Hence the Six for Saturday post instead. Obvs. Except I don't think I even had five things to share, so I definitely can't scrape up six now. Whitney is in the early stages of a science fair project too and so far we're okay but back when we were in the idea stage she was set on doing something with animals (we don't have any animals!). She talked about playing music for dogs at the pound to see how they responded (um no!) then she thought she'd make it easier by doing it with rats we purchased (what?!). After she finally realized those crazy ideas weren't going to happen I got her to settle on something much easier. She's now planning to do something about memorizing numbers. I'm still nervous about it and now wishing we had known about the bubble gum idea! Your hair looks great. I am sure it will take some getting use to, but enjoy it.